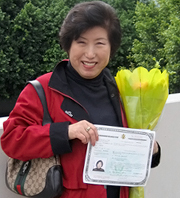 My mom came to the United States from South Korea in 1977 and later became a permanent resident. For years, she made excuses as to why she couldn't take the citizenship test--like how she was too busy with family and work. In the end, she rationalized that a green card was good enough. That's why I was surprised when she called me one day and said, "I'm a citizen!" I had no idea what she was talking about. "A citizen of what?" I asked. She proudly said, "Citizen of the United States of America." A month later, my mom asked me if I had the time to come to her swearing-in ceremony. I couldn't believe she was asking me! How could I miss something like that? Of course, I'd be there - I wouldn't miss it for the world. The ceremony was at the Los Angeles Convention Center. It was a sunny Thursday morning. When I entered, people were split into two different entrances: "new citizens" to the left and "guests" to the right. Over 4,000 people, including my mom, became citizens in Los Angeles that day. As I waited for the ceremony to start, I noticed this young woman standing next to me. She was about 18 or 19 years old. She looked bored. Turns out she was waiting for her mom to get her citizenship, too. I asked her if she helped her mom apply. She told me about how she helped her mom study using flashcards. I was jealous. I wanted to be the one holding the flashcards, quizzing my mom about the number of stripes on the flag and the American presidents. I turned to my dad and asked why nobody had told me that mom was studying to be a citizen. He said the process wasn't that important. He made it sound so trivial, as if the end result was the only thing that mattered. But the process was important! My mom studied for almost nine months, and the whole time she kept it a secret from me. Growing up, I interpreted when we went out and translated documents for her. I've always been part of the process. My dad and I stood in the back and watched the sea of people all giving up their allegiance to the place that they once called home. All I could think was somewhere in that crowd of voices was my mom. The ceremony was short, and the new citizens were funneled to booths to pick up their naturalization certificates. My mom got hers. She couldn't take her eyes off that certificate. Outside the convention center, friends and family were cheering for their loved ones, holding flowers and balloons. I felt like I was at a graduation. When we got home, my mom and I sat on the couch. She showed me her study guide and the things she learned. But still, the same question kept nagging at me, "Why didn't she tell me she was applying to be a citizen?" She looked at me and smiled before she spoke. "I know you're thinking, 'Mom can't speak English well and doesn't seem driven.' There are things that a parent wants to show their child. I did that, and you can feel comforted by it." I was overcome by guilt because I had thought those things when I was younger. People asked me how my parents could live in the U.S. for so long and not know how to speak English. I was embarrassed. I remember when I was a kid and I was in the backseat of the car. I told my mom that I would only speak English to her and I would never speak Korean again. I said that's not what people speak here. I thought the knowledge of the language reflected a person's intelligence. All those memories came flooding back to me as she sat there smiling--as if what I had done in the past didn't bother her. I didn't know what to say, so I changed the subject. I asked her tell me some of the things that she had learned. I am proud of her. I'm not sure I couldn't have done what she did. I didn't know how to say it to her right then and there, but I hope she knows. Mom, I'm proud of you. Oh Angela, that story is touching. Congratulations to your mom!